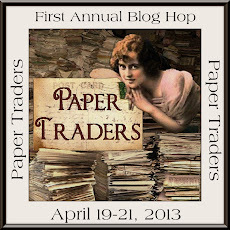 I am so excited to participate the First Paper Traders Blog Hop. I hope it will be a way for you to get to know me and a few of the other group members better, see our art, and get a chance to win some nice prizes that are being offered along the way. Maybe you'll even be inspired by what you see and want to join the group. I am Sam, I live in North Cornwall, UK. My artwork involves textiles and handmade beads, I get my inspiration from my local surroundings, the Cornish rugged coastline and the ocean, so a lot of my work is in blues and greens. My sea inspired hand made beads prove to be very popular. This is a fairly new blog , as I wanted a blog which was dedicated to my textile work ! I am constantly working on new projects and trying out new techniques. I am offering two gifts for my lucky winner ! The first item is one of my hand made textile brooches in teal blue. The second gift is a pack of my textile art beads, in sea inspired blues, the pack contains 6 beads. These prizes will be randomly awarded to blog readers who leave me a warm, fuzzy comment. Just comment below and provide a way for me to contact you and I will pick a randomly drawn name from those who leave a comment. One entry per person, please. Sam, your use of texture is just amazing. I want to reach into the screen to touch those beautiful pieces of art. Love that texture Sam, as Donna says I want to touch them. Sam, your blue beads are wonderful! Good Friday Morning to You Sam, So nice to meet you. Love your give away, I have an entire pinterest page about aqua,teal and indigo. I will pin these to it. I will see you at Paper Traders, Keep smiling and creating. Textile and fabrics have only just begun to appear in my work, so you are an inspiration. Those beads are beautiful!!! The colours make me think of a rugged coastline...I wonder why? Hello Sam, Nice to meet you. Your beads and broach are beautiful. I wish there was more time in the day for everything I would like to do. I have added your blog to my bloglovin and will be able to see all future posts. Hi, Sam! These beautiful creations are fabulous!! I love blue and your brooches and beads are just beautiful. So happy to have visited your blog via this hop. You are quite talented -- beautiful! I really love the green and purple beads below the blog hop post, as well as the brooches! So unique and romantic. Thank you for the offer on this blog hop! Hi Sam! I'm so happy that you're a part of our group. Thanks for participating in the blog hop... your offerings are gorgeous!! Hi Sam, nice to meet you ! i'm a brit living in Canada but i used to go to Cornwall as a child great memories ! thanks for the chance to win your lovely goodies ! have a great weekend ! Hi, love your brooches and beads, teal is one of my favorite colours. My Dad drove into our yard when I was a little girl in a brand new teal and white Chevie, it was the first time I had seen that colour and it was instant love and I've never changed my mind about it! Nice to see a fabric artist in the blog hop. Sewing was my first creative love and I still do lots of it. Currently I'm making table toppers for a friend's daughter's wedding. Hi, I love your blog and art here. The flowers in your blog header are so beautiful. I love stopping by on the blog hop and will stop by again soon. LOVE< LOVE the look of your blog. Your header is gorgeous. What wonderful prizes. Those beads are awesome. Glad you are a part of PT. Your work is amazing. I love the flower brooch and the art piece you created with the flowers is wonderful. I must try some to make beads..they are so creative! What lovely work sam! I do love the look and feel of your blog and all of your pieces!! Hi Sam, happy to have fpound your blog via this fun blog hop. LOVE your brooches and beads! Hi Sam I'm glad to have found your blog! This is such a great blog hop! Love your blog...awesome! This is such a fun idea, getting to see wonderful art and learn more about all of the participants as well. Thanks for joining.